The use of shared drives is becoming more common among small businesses. Thus, many users are required to browse through internal filling systems. Such shared drives are similar to a modern-day version of physical filing cabinets. Back in the day, secretaries were experts at setting up systems for proper internal filing, using well-established nomenclature. Any filing system in modern day needs to allow it’s users to be able to navigate with ease and intuition. The naming conventions developed are naturally dependent upon what kind of industry you are in, along with the kind of data you are categorizing. The following outlines a few basic tips you can adapt for organizing your filing system. In file names, steer clear of using characters such as @ or &, limiting their use to folder names. Only use symbols if the use is employed officially in your company. As an example, take a department called Accounts & Finance. Using the symbol ‘&’ would be appropriate in their designated folder. Meanwhile, if there is another department called Social Media and Marketing (note the use of ‘and’ instead of ‘&’), abbreviating ‘and’ to ‘&’ should be avoided. If having such characters in the names of certain folders causes any trouble, it will be easy to change because only a few folders would contain them. The use of symbols in file names, however, is something that should never be practiced. It makes searching for specific files a hassle. In addition, new software that might not support the use of symbols could result in a nightmare of having to rename hundreds or even thousands of files. Abbreviations are a big no-no. Your nomenclature system should not include them, unless and until a particular abbreviation is commonly used. Certain departments in many organizations have their own jargoned abbreviations. If such abbreviations are used in file naming, it might create problems for other departments wishing to retrieve any kind of data. Another thing that should be kept in mind while naming files is the convenience of any future users who may wish to retrieve the data. Doing this, you will avoid using abbreviations, which might be commonly used today, but may not be commonly known among company members after a period of time. Whatever you choose, make sure that all users are well aware of the policy and that the naming of files is as consistent as possible. Standardization helps users in navigating through the filing system. It also lets users know the proper method of filing things. Standardization can be different for every kind of organization, but here is a basic structure with which you can begin thinking of your strategy for standardization. In order to develop the first tier, you should look into your company’s organizational structure. Most businesses with a centralized structure organize files and folders by department. Companies that operate at different locations might have their files sorted, first, into locations and, then, into departments. The second tier of your hierarchy can consist of project categories that are handled by each department. For example, your marketing department might have three dimensions for their projects such as Online Marketing, Offline Marketing, and Customer Retention, etc. An accounting department might have separate folders for payroll, bookkeeping, taxes, etc. The third tier is usually based on time. The particular time period varies department to department and company to company. This could be in days, weeks, months, quarters, years, etc. It is important to discuss the requirement with relevant heads of departments in order to better optimize the third tier for each department. For example, accounting and finance may need folders for fiscal years and quarters, while the operations department may need daily and monthly folders. This is the final tier and would include files. 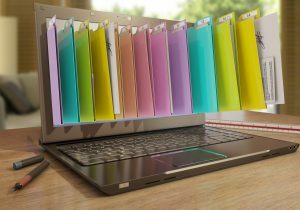 The naming of files in tier 4 should be consistent and every employee who uses the filing system should be aware of the set standards for file naming, i.e. the Nomenclature System.